Information about swimming pool health and safety. To assist the Certified Pool Operator in getting the pool ready for the season, you can print a copy of the Pool Inspection Check List that outlines all that is need to get your seasonal pool ready for the required pre-opening operational inspection. Once the CPO completes all information on the Check List, you can request an inspection by emailing or calling your health inspector or call (505) 768-2716 to schedule a definitive date and time to conduct the pre-opening seasonal pool inspection. Be prepared for an emergency. Know where you can immediately reach pool-side rescue equipment, including a ring buoy with an attached line and/or a long handled hook. This equipment should never be used for play. A public telephone should be located near the pool. "The Best Preparation is Prevention." Learn and practice CPR. In case of an accident, while someone is calling 911, be prepared to administer CPR. The American Red Cross recommends CPR training to administer the procedure in an emergency. There is no substitute for hands-on practice in a CPR instruction course. Make sure your baby-sitter knows CPR. Call the local Red Cross at (505) 265-8514 to inquire about classes. Never leave a child in a spa. The temperature of a spa is usually 104 °F. After only 10 minutes in a spa, a child's temperature may be 104 °F. Double-leak resistant diapers are essential. The contents of regular diapers can seep into the water and expose all who come in contact with that water to bacteria that can cause gastrointestinal infection. This can be prevented. 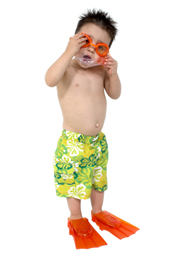 When in a pool all who wear diapers, should only wear those that are double leak resistant with waterproof fabric features. These diapers are not very expensive and are easily attainable. They can be purchased at almost any store that sells other types of diapers. Locked doors and gates should prohibit access to the pool whenever swimming cannot be supervised. Barriers at least 48 inches high should completely surround the pool area with clear spaces between bars/railings 4 inches or less. Gates/doors should be self-closing and self-latching. Do not prop open. Enforce the rules. Post the rules. "No running," "No pushing," and "Never Swim Alone." Damaged or missing pool drain covers can be deadly. A person's hair can get caught in a defective drain, with a force that holds the head under water. If a drain cover is missing, one's arm can be pulled downward inside the drain. Various tragic accidents have occurred because of missing or damaged drain covers. An anti-entrapment grate should cover the main drain. Don't get in the pool if the drain is damaged or missing. One should be able to see the bottom of the pool.